Dinosaur Comics - November 26th, 2010 - awesome fun times! November 26th, 2010: Dear readers (all of whom I love)! 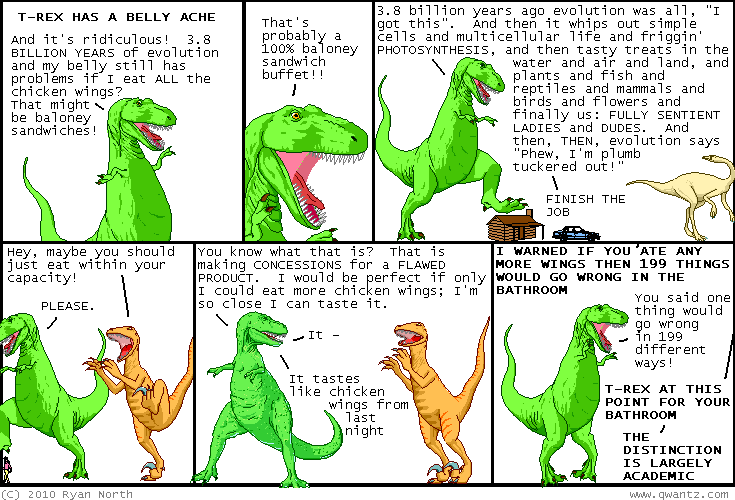 It's called "Dinosaur Comics: Dudes Already Know About Chickens" and it's got all the comics from 2006, plus an introduction by Randall Munroe, plus all the secrets, plus THREE INDICES and an interview with me and I really think you'll like it! In a case of remarkably good timing, I did an interview with Laura at Comics Alliance yesterday where we talked about the book, so if you're all "I don't know if I can handle this; is there anyway I could read more about it first?" then I've totally got your back. By following that link you can also see what my duvet cover looks like! I hope you like my book, you guys!